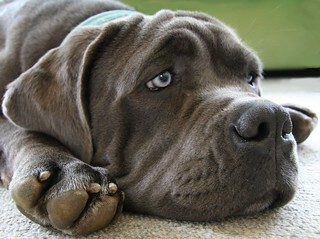 Our latest foster dog - Lucy the Neapolitan Mastiff, just after she arrived. She's hiding under the coffee table :o) At 5 months old, she's already the same size as our 7 year old Shepard / Lab cross! Picture protected by Creative Commons License (Attribution, Share Alike) ©2010 Tim Dawson Photography. Photographer must be credited in all uses of this photograph.